What gauge wire to use? A frequent topic of conversation is that of wiring. What kind of wire to use? How long? How to power up various parts of the system? Answers to these and more follow, taken primarily from the message board. Warning: This is not a terribly technical discussion. If you *really* want to understand wiring and electronics, take a look at the tutorials section on the techs & tips page, look for the electronics link. What this will attempt is a brief "how-to" on connecting up wiring to your controls. In a nutshell, a switch is a way of closing a circuit. A circuit is essentially a circle of electricity. When a circuit is "open" there is a break in the flow of electricity, and the signal cannot flow. When a circuit is closed, there is no break in the flow of electricity and the signal flows. One side of the switch is the "common" side, the other side of the switch is the "positive" side (note: an electrician would yell at me for putting it this way, but it suffices for this discussion). Activating the switch (pressing it usually) closes the circuit by connecting the common side of the switch to the positive side. With the circuit open, electricity cannot flow. With the circuit closed by activating the switch, electricity flows. There are two types of switches - microswitch and leaf. The leaf switch is easy to wire - there are only two contacts (common, positive) to connect wires to. When the wires are connected and the switch is activated, the two contacts connect to each other closing the circuit. In the picture, the left side is where the common and positive wiring contacts are. On the right side is where the push button presses the two metal leafs together, activating the switch. The microswitch type of switch is a bit more complicated. It has 3 contacts, of which you will need to choose two to wire. The bottom connector is the common contact. Then, instead of one "positive" connector you have to choose between two of them -- NO (Normally Open) or NC (Normally Closed). Read the next two paragraphs to explain that, or skip to the last paragraph to see what this means to you. NO means the switch is normally open (i.e. the button is not pressed down when it is not being used, or in simpler terms the button is "up" when idle). To activate whatever the button's supposed to do, you press the button, closing the switch. Closing the switch in turn closes the circuit, allowing the electricity to flow and sending whatever signal gets sent by the button. 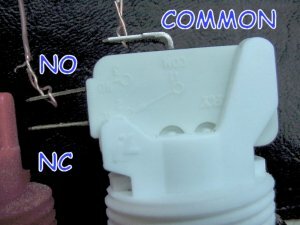 NC is the opposite of NO, meaning the switch is normally closed (i.e. the button is pressed down when it is not being used, or in simpler terms the button is "down" when idle). To activate whatever the button's supposed to do, you release the button, opening the switch. Opening the switch in turn closes the circuit, allowing the electricity to flow and sending whatever signal gets sent by the button. Confused? 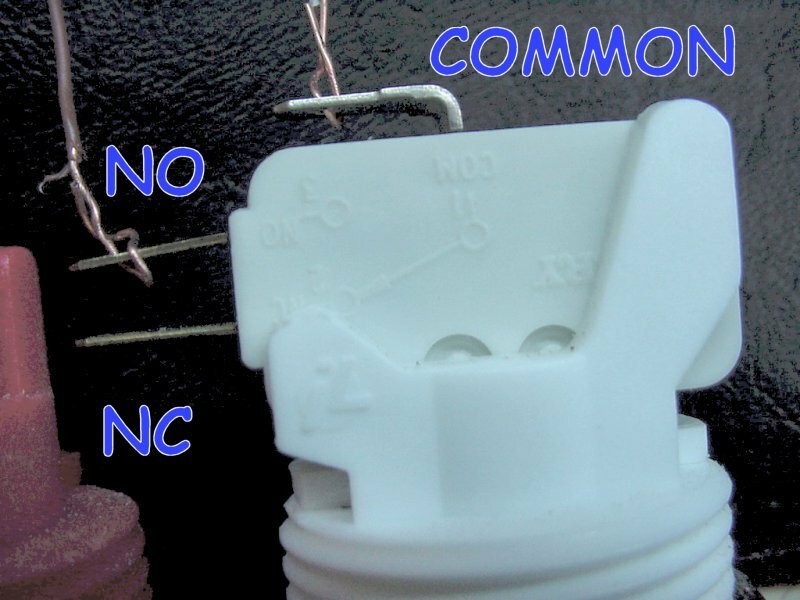 The short of it is this: Unless you're doing something out of the ordinary, you'll want to connect wires to the "common" and "NO" contacts (AKA "leads") of the switch. That way, the button won't do anything until you press it, which is typically what you want. Take a look at one of the microswitch buttons wired on my FrankenRig (test rig) over on the left. Typically you'll want to wire all the common wires from each switch to a centrally connected point, such as a wiring block from RadioShack. This will also be connected to the common wire from your interface, be it a keyboard encoder, or what-have-you. The "positive" side wires will all go to the individual control inputs on your encoder/interface. NOTE: If you're using a keyboard hack, it's a bit different. You'll still wire the switches the same, but the wires coming from the switches will instead go into a matrix that you'll have mapped out ahead of time. See keyboard hacking for more information. What gauge wire to use? From Bob Roberts, for AC power and grounds, use 18 AWG (.821 mm2) gauge wire. From Arcade Solutions, for the rest of it use 22 to 28 AWG (.326 to .081 mm2) gauge wire. Conversion charts here and here. How To Wire a Cabinet - Powerjaw passed on a link to an excellent tutorial by Bob Roberts, a respected figure in the Coin-Op collection hobby. This tutorial walks you through taking an empty cabinet and wiring it for use as a Jamma cabinet. Fairly applicable to us and worth a read. Thanks Powerjaw! Arcade Solutions was kind enough to write up a short how-to on using an encoder, which includes a section on physically connecting them. "I have the LP24 and plan on using it in matrix mode with the layout described on the interface page of this site. What I am wondering is do I run the wire from column A, row 1 to the NO pin on the microswitch and run another wire from the COM to the ground pins on the LP24? Also, can I daisychain the ground wire between all buttons (i.e. run 1 wire to each ground and then back to the encoder)?" "It probably doesn't matter if you connect to COM or NO with each wire, but to make things easier I treated the A wire as a ground or common and connected all of then to COM and used black wire so I didn't get confused. As far as 'daisy chaining' the Common wire, I think you can but remember.. Doing that is like a serial (as opposed to parallel) connection and if there is a problem with one connection than all connections after that will not work. I connected them parallel and ran them all to one terminal block. If ya want to see what I did check out the controls section of my site.
" I'm going to be hooking up Happs microswitched buttons and joysticks to a Hagstrom LP24, and I'm going to set the LP24 to a 22x2 matrix. If I use the example of the 22x2 matrix that's on the "Interfaces" part of this page (where up1 is "A1" and down1 is "B1", which of the pins on the microswitches gets connected to which of the inputs on the LP24?" "There are 3 pins on the microswitch. N.O. (normally open) N.C. (Normally closed) and a common. The 2 pins you want are the common and the N.O. It wont matter which wire you hook to which since all you are doing when you depress the button is completing the circuit between the 2 connectors." From Mr. Salty: I'm using 12Vdc light for my coin door light.... I just put an extension on the PC power supply and used that. It works great. There are 12V and 5V leads on each PC power supply line. I just looked at which was which on a hard drive that had them marked and used the 12v lines.... works just dandy. From Michael Bobroski: Same Here... Works great. From Mr. Salty, a way to turn your PC on from the outside, and a reset button as well: Its actually very easy.... All I did was get a standard normally open momentary switch from radio shack and lengthen the wires that go to the motherboard and attach it to the switch. Then mounted the switch under the front edge of the cabinet in front. I had to drill a hole to get out of the cab though. Anyway... now all i have to do is hit the switch and the PC powers up. I did the same for hardware reset too. works great. I have a picture of it on my site under the power section. A good suggestion from Torgo: Many new ATX motherboards support a "power-on from spacebar" feature, and fortunately, MAME uses the spacebar (player 1, button three by default). Since I bet any of us with keyboard encoders or keyboard hacks, already have a button wired to be spacebar, all you gotta do is hit button three and the computer fires up. You should check your motherboard's manual if you have an ATX board. Mine just required a single jumper to be switched to enable this feature. And from Michael Bobroski: Also along this line of starting up the PC, a few of motherboards also have 'Power up w/ the double click of a PS/2 mouse button'.. These are all option you will find in either your BIOS menu or your motherboard manual. Unfortunately, I have serial mice devices, so I can't use this function -- I simply extended the length of my wires, and attached a microswitch to the front of my machine, in similar fashion to Mr. Salty. The latest entry from COBeav: My cabinet design is based off Scott's Unicade and he had the great idea of using a relay controlled by the PC's power supply to switch on the monitor, marquee light and speakers. Scott's design used a power strip which was hacked to incorporate a relay as the switching mechanism. My first attempt at using this method resulted in a destroyed power strip so I decided to build the same thing in a junction box which will be incorporated into the cabinet. This design has two outlets, one is always on and the other is switched using a spare hard drive power connector from the PC.